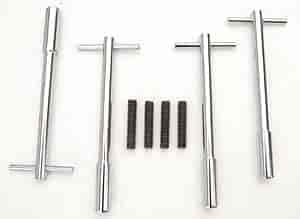 Mr Gasket Valve Cover T-Bar Wing Bolts Length: 5-3/8"
Chrome-plated for durable good looks, these precision engineered wing bolts have extra long threads to allow for the additional thickness of Mr. Gasket reusable valve cover gaskets and custom valve covers. T-bar wing bolts feature studs. All sold 4 per package.